Few things have influenced product politics as much as 80 Plus Gold. Seasonic was the first manufacturer to list power supplies on its homepage meeting the EPRI (Electrical Power Research Institute) guidelines, and they presented their first certified models at CeBIT 2009. With the recently launched X-series, Seasonic aims to prove the marketability of 80 Plus Gold PSUs. We have the 750W model for review today, so let's see how it measures up. 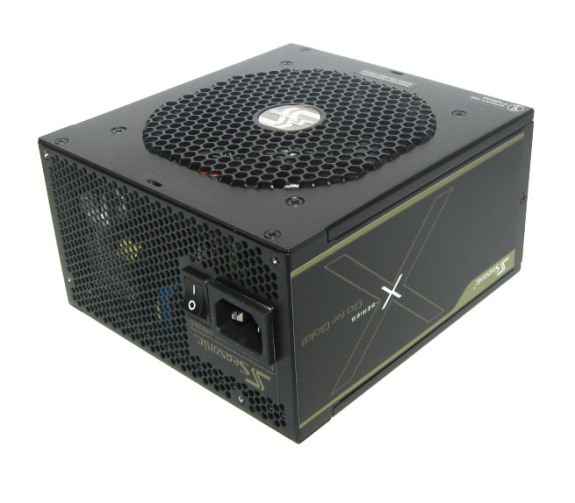 Is it a great new PSU, or is 80 Plus Gold simply a new way to increase prices? Beyond the remarkable efficiency and high-quality technology, the power supply contains a fully modular cable system and makes a good impression with its simple elegance. The X-Series also includes "hybrid silent fan control", which regulates the three speed settings of the fan. The power supply runs completely silent up to 20% load, at which point the fan begins to rotate slowly; at higher loads fan speed increases again to enable sufficient cooling. Seasonic uses a PWM fan to allow graceful ramping up of fan speeds, which we will cover later in this review. Beyond the various certifications and features, this ATX 2.3 power supply offers a 5-year manufacturer warranty and uses active PFC to allow its use on all the major power grid standards. Enermax delivered good results in our previous test with the latest Pro87+/Modu87+ series, and it will likely be Seasonic's main competition. Of particular note is that the noise levels of the Pro87+ and Modu87+ are extremely quiet throughout the load range. Enermax also delivers products catering to the midrange 500W market, but we will have to wait until summer for Seasonic's answer. When the other models are ready, Seasonic let us know that they will have PSUs rated below 500W for those that don't run a high-power system. We should also see additional manufacturers soon with their own 80 Plus Gold offerings, so it remains to be seen who will have the best product. Apart from the marketing hype, we'll need to see new features in order to surpass the competition. The X-Series has an MSRP of $200 for the 750W unit we're reviewing, but you can find it online starting at $180. So let's see if this expensive power supply is worth the money and if Seasonic can achieve new efficiency levels. We will also look at the construction, voltage output, and the unusual topology; high efficiency isn't the only point of interest with the X-Series.